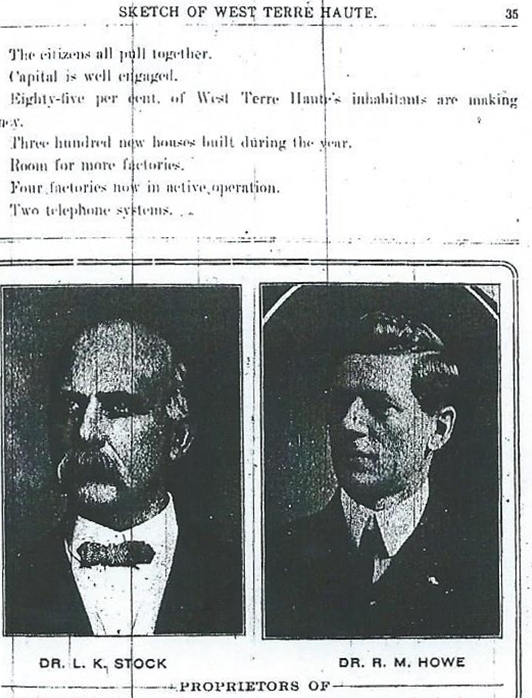 As 1906 dawned West Terre Haute stepped to the threshold. Town boosters believed it was about to cross through the door to becoming a large important town. They had some reasons for feeling so. In the last decade the town had grown almost six-fold as it took advantage of the mineral wealth that surrounded it. New coal mines had opened, clay plants grew, small businesses blossomed. Workers flooded into town to take jobs offered by the business boom. Another key was the opening of the new Wabash River bridge. 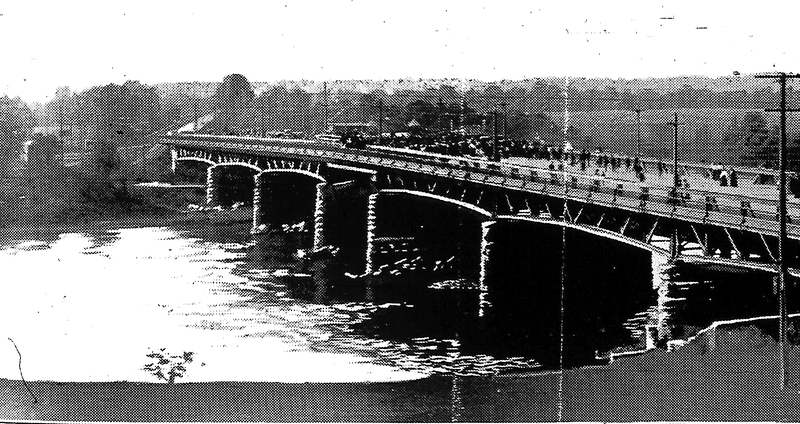 The modern structure replaced a creaky 19th- century bridge and made secure the connection with Terre Haute. One of the ways West Terre Haute announced its present, and its hoped-for future, was the publication of its first city directory in 1906. 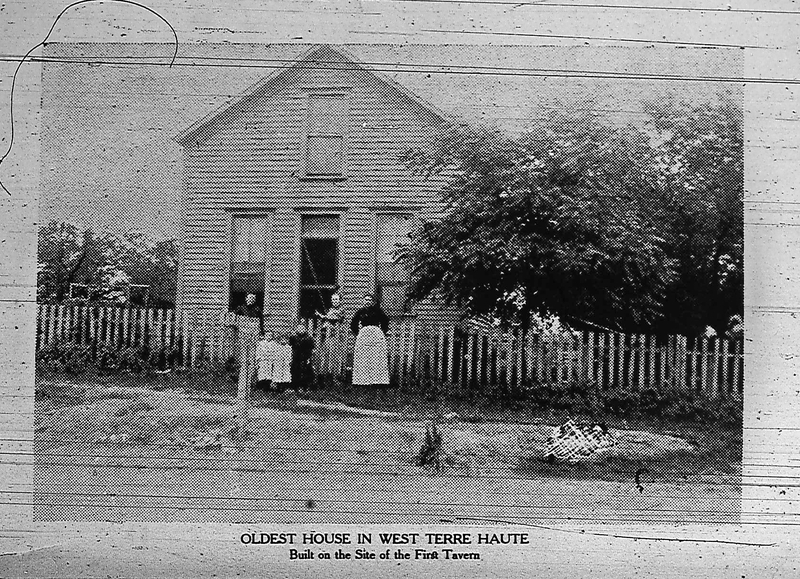 True, it had been part of Terre Haute city directories since at least the 1890s, but this effort was devoted entirely to West Terre Haute. It was an important step. Not only could it be used by the town’s citizens and area businesses, it was a handy piece to send out to advertise the growing town and attract prospective industries and businesses. 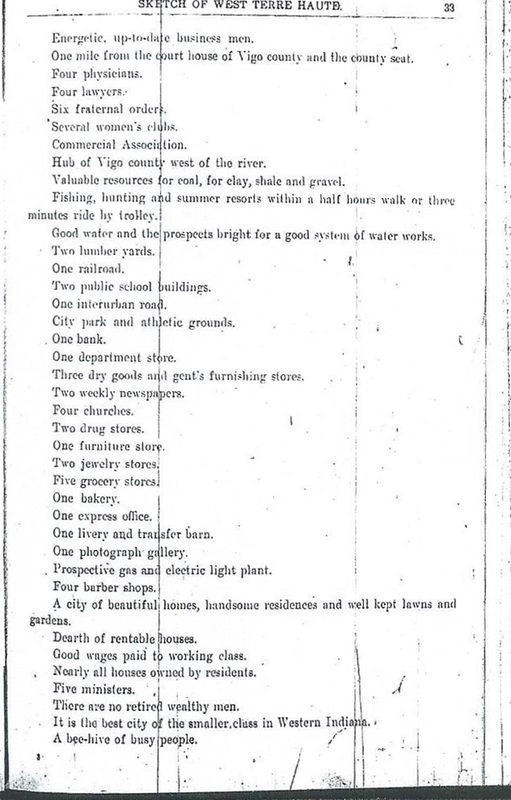 The directory opened with a rather good history of the town which chronicled its growth from struggling village dependent entirely on farming, to the discovery and exploitation of coal mines, and highlighted the town’s growth. In the two pages shown below it announced the advantages it offered to prospective newcomers. It hoped to show it was a “Wide-Awake Town,” bustling, energetic, open to its future. 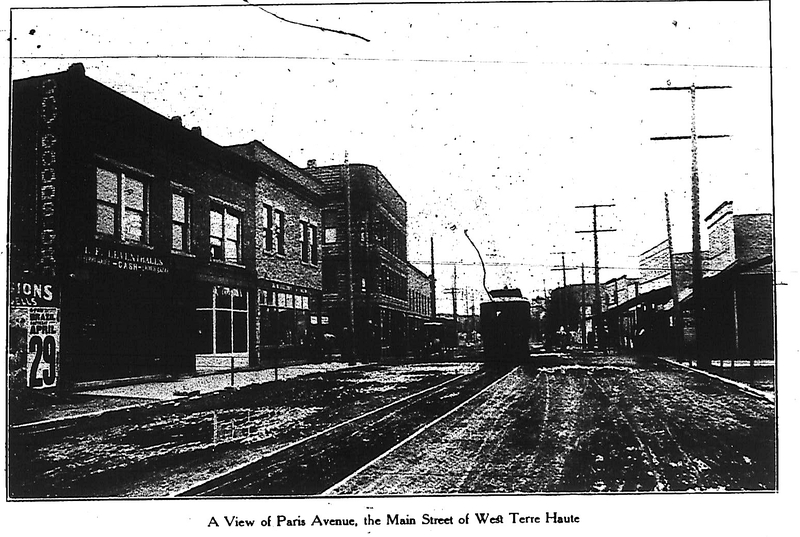 The Directory featured a few photos, two of them focusing on Paris Avenue then West Terre Haute’s main street. The new buildings it featured and the streetcar line showed that the town was growing, connected, and ready to take off. But the key to the West Terre Haute Directory was the list of its citizens. Spread out over the pages one can get a sense of the town as it was. It gave the name, address and occupation of each business or householder. By far the largest number of listed jobs was that of miner. Perusing the directory made it clear that West Terre Haute was a miner’s town. And from their addresses you can see the formation of the “working class” areas of the town. The miners, clay workers and other labors were concentrated south of National Avenue, in the newer areas west of Market Street (There was still a row of shoddy shotgun house on Market Streets when I was growing up. They tore them down to build the new Post Office in the late 1960s), or scattered along streets on either side of National. 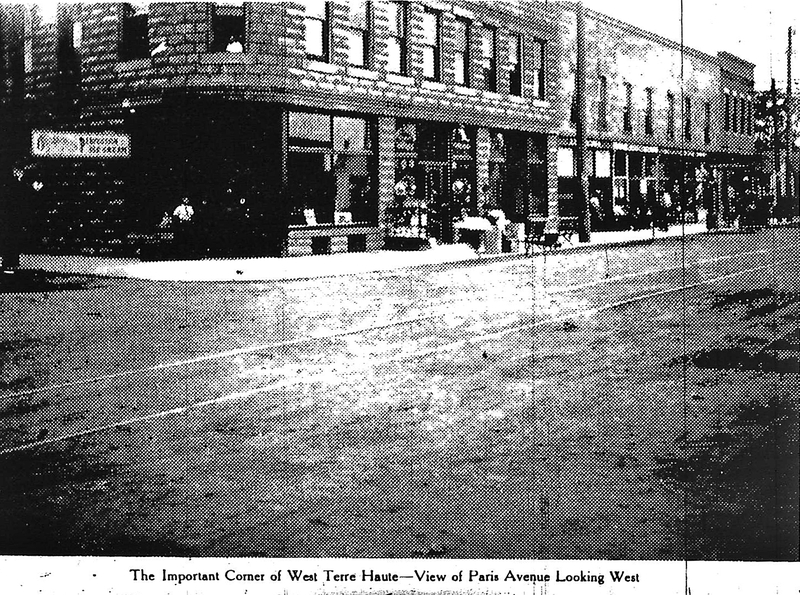 The town’s “elite” tended to be within a few blocks of Paris Avenue. The McIlroy family, merchants and leaders loved just south of the Avenue. Burton Cassaday, druggist, postmaster and perhaps the town’s biggest booster lived on Paris Avenue between Sumner and McIlroy (now one of the most rundown areas). J.S. Hunt, the leading doctor lived in the same neighborhood. Glancing through the 108 year-old directory I see many names that were familiar to me growing up, and which still live on in the town. Of course, I looked for my ancestors there. Great-Great Grandfather David Arthur (see blog entry for August 7, 2013) and his children lived in a stretch of houses on Miller Avenue. My Hants (also Hantz) family lived in three houses along National Avenue (my grandmother was born at 101 National). The matriarch was Susannah Hants, widow of Andrew Hants, a courier born in Pennsylvania. Living with her were three of her sons. John was a shoemaker, and Ellsworth and Emerson were “at home.” Emeron is the one most well-known to me because of my grandmother’s enduring love for him. Emerson was profoundly handicapped. In one census he was listed simply as “idiotic”. He was a kind soul, with little speech. He was sometimes affectionately called “shickie-whoppie,” because that is one of “words” he said most clearly. Next door was Susannah’s son. William. He was my great-grandfather, the adored father of my Grandma, Hilda Hants Chrisman. Oddly, he is listed as living alone. At first it struck me as odd that my great grandmother Lulu was not listed. But then I recalled that this was around the time that my great-grandparents were having marital issues, primarily caused by William’s drinking and the earlier death of their infant son. Was this one of the times Lulu escaped to David Arthur’s house on Miller, taking Grandma and her sisters with her? Quite likely. If you know what to look for, even long dead pages can tell their story. One more name caught my eye: James Leasure. James lived on Edwards Street with his carpenter father and his mother. The directory listed him as a farmer. In the future he would become a blacksmith and auto repairman. He would also become the one of the protagonists in one of the most infamous days in the town’s history (see “Love Usurped, March 7, 2013 blog). 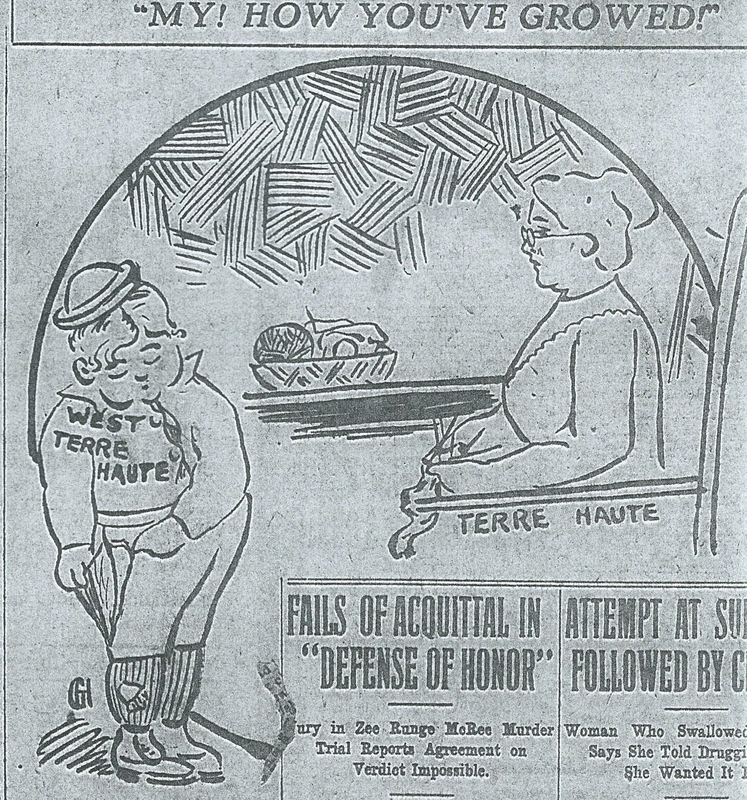 But he, like West Terre Haute could not know their futures in 1906.